And naturally we created a gaggle of funny words to describe the things we should, and the things we shouldn't do, acccording to the Johnny Bunko Lessons. At the end of the week Petaj and Arrrteest snagged the top spots and each of them won an autographed copy of Dan's book. You can check all the words we created by clicking on the links and definitions below. And if you want, you can still play with Johnny. You can create a word and vote for your favorites. So give it a try! Maybe you'll invent a word to describe your next big career move! Thanks again to Dan Pink. Lesson #1: There is no plan. See: Do you think I should stick to the plan? Lesson #2: Think strengths, not weaknesses. Lesson #3: It's not about you. See: There is no "U" in "Team"
Lesson #4: Persistence trumps talent. Lesson #5: Make excellent mistakes. Lesson #6: Leave an imprint. See: What are you doing to the cubicles? 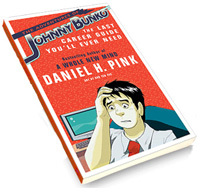 "The Adventures of Johnny Bunko" by Dan Pink.